It's more common than you might realize, and it can be deadly. You've been on the road for three days straight, with not enough sleep, and the air-conditioner and diesel exhaust blasting your face and eyes. After a while, your lips and face get chapped, your neck and shoulders feel stiff, and your eyelids become so heavy you have to stop and grab some coffee. Even then, your eyes may continue to feel tired and burning. Because you're on a tight schedule, you press on even though your eyes continue to bother you and you know you're becoming a road hazard. There often just isn't time, on the road, to adequately protect your eyes. As you are probably aware, there are several things drivers can do to prevent or relieve tired, strained, irritated "Trucker's Eyes" on a long distance trip. You'll be pleased to learn that not all of them involve coffee or eyedrops, either. Bio-Logic Aqua Technologies Biomedical Research has developed a wealth of new information about caring for eyes and skin - the result of a decade of research into dry air and eye moisture. Even if you don't follow these recommendations to the letter, you never know when the information might come in handy. It might even prevent an accident. Mucin layer. This bottom layer glues the tear film to the optical surface. The most physically irritating result of tear film moisture loss is an over-concentration of electrolyte (salt) and proteins in the aqueous layer. The results are itching, burning, eye-strain, fatigue and other symptoms. Lack of adequate tear film moisture is called, "dry eye," "dry irritated eyes," or "trucker's dry eye." 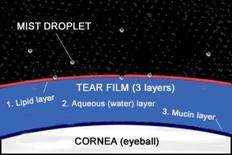 Soothing dry irritated eyes is a simple and logical procedure: Simply add moisture to the tear film! However, over the past 110 years of medical research, this has proved more easily said than done. While traditional formulated eyedrops can be beneficial (mostly as a moisture sealer), they are difficult to apply and not always effective. And you need to pull your vehicle off the road to apply them! Also, the chemicals and preservatives in eyedrops can cause an allergic reaction. That's why it says on the label not to use eyedrops more than three or four times a day. The best way to keep eyes moist is to mist with Nature's Tears EyeMist whenever discomfort is felt. This unique moisture-mist provides the correct pH balance, mineral content and osmolarity to penetrate to the tear film's aqueous layer in just the right amount -without flooding. Because the product is an all-natural mist, there are none of the drawbacks to conventional eye drops. Best of all, you can apply it while driving! Even if you use eyedrops, they will become more effective as a moisture sealer (to help decrease tear film evaporation), if you apply Nature's Tears EyeMist first. Because Nature's Tears EyeMist has no dosage limit, you may also apply the mist between eyedrop applications-whenever eye discomfort is felt and/or as a preventative before you feel the discomfort. Always keep Nature's Tears EyeMist in your glove compartment! 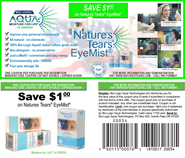 Apply Nature's Tears EyeMist three-to-four times a day, or whenever eye discomfort is felt. A one-second "Just-a-Mist™ sweep across the face instantly replenishes tear film moisture…naturally, easily, and in just the right amount. And remember: Nature's Tears EyeMist cannot be over-used. 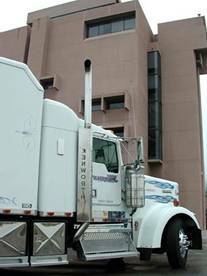 Vision care tips for truckers. Smoking while driving is especially unhealthy because of the confined space. It addition to damaging lungs and heart, cigarette smoke is extremely irritating to eyes - even with a window opened. Truck stop showers are great but long, luxuriant motel baths are even better. If you can't take a bath, take frequent long, hot showers, keeping eyes opened and breathing in the steam. Keep Nature's Tears EyeMist handy wherever you go. Mist when you get up in the morning, after naps, after showering or cleansing, whenever eyes or face feel tired or uncomfortable, and three or four times a day as you drive as a preventative. Breathe the mist in deeply, following the Yoga technique of inhaling through the nose and exhaling through the mouth.